Need to expand your distributor network? Ready for a global distributor network? Since 1992, Trust Network has successfully brought manufacturers and brand owners in the musical instrument and professional audio industry together with great distributors. Using our in-depth knowledge of the ever-changing international network of decision makers we establish your brand with trusted distributors and re-sellers well suited to your product. A genuine passion for the music and sound industry plus in-depth knowledge of its international sales networks make Trust Network a precision tool for getting your brand to market. Our approach combines professional research and top-flight sales presentation to identify and enthuse suitable distributors and resellers for your product. Our business analyses form the basis of mutual agreements between you and them to bring your brand to market with the commitments necessary for it to gain traction in export territories. At this year’s NAMM Show Ivan Music of China won the Distributor Of The Year Award 2016 from Levy’s Leathers of Canada. Ivan Music’s appointment as Levy’s Chinese distributor was achieved by the Trust Network when engaged by Levy’s to review and resolve their distribution in China. NAMM recognises The Trust Network’s exemplary business practices that have stood the test of time. 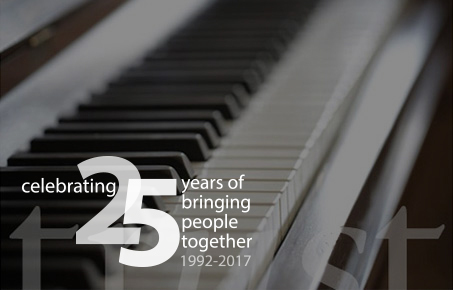 At the 2017 NAMM Show The Trust Network Ltd will be honoured with the National Association of Music Merchants (NAMM) Milestone Award for 25 years of service in the music products industry, presented by NAMM President and CEO Joe Lamond. Harvey Levy - Vice President, Levy’s Leathers Limited, Canada.